Some accessories franchising and chains, which I'll avoid naming in this post, are self-proclaimed world's leading ear piercing experts, but then they routinely pierce ear cartilage with a gun – or pierce the lobes of months old babies. 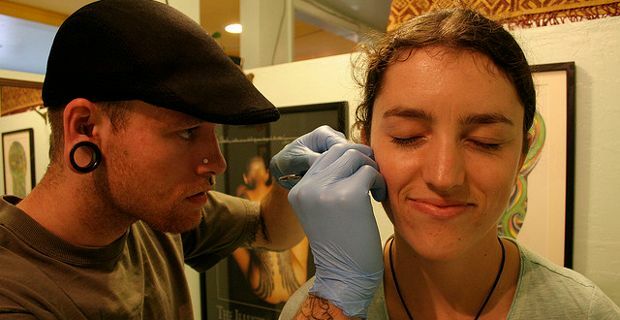 In this post, then, we will focus on the cost of ear piercing in a body art parlour. Do not let yourself be fooled: piercing guns are often made up of acrylic components that can not be autoclaved, therefore cannot completely sterile! And the stud forced at the back of the piercing does not leave enough room to accommodate for swelling - that's way these piercings more easily than not end up in complications. Not to mention how wrong it is to gun pierce a cartilage, anywhere in the body, ears included. On top of it, some of these accessories stores may offer a free ear piercing service, but only when purchasing the piercing earrings or starter kit- and it could cost anything from £30 to £80. Ear piercing is serious stuff and should be left to professional piercers, who will use only disposable, single-use blades or cannulated needles, just like for any other body piercing. This is why we strongly recommend anyone to contact their local piercing/ tattoo/ body mod studio before resorting to try a chemist of jewellery chain instead. Body piercing parlours will normally charge you per piercing, for instance around £15-20 for the lobe, included the price of the jewel- that some use in titanium, other in surgical steel, and can affect the final cost. On average, though, a pair of lobe piercings professionally done should cost between £35-50. All piercing healing times and aftercare information will be given by the piercer, sometimes in the form of leaflets to take home with you, and it's imperative that you look after your ear piercings properly.